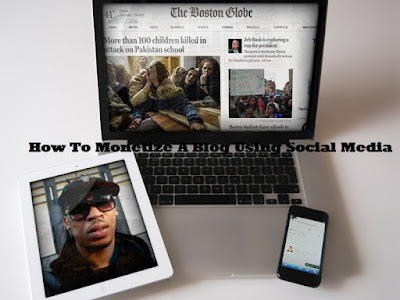 Here are a few easy steps to monetize your blog with the power of social media. Social media has become an essential part of our lives and a lot of major corporations are using social media to gain new customers. Why not use social media to profit from your blogs. Create a blog using a popular blog site like Blogger, using original content only. A great way to create original content is to share information about things that you have great knowledge of to make it into a viral social media trend. For example if you know how to write professional resumes, then create a blog about resume writing. You can be more specific like (Resume writing for college students), or (resume do's and dont's). Once you have established your niche blog then you can monetize it. Sign up for free affiliate marketing programs like Google Adsense or Mylikes. Affiliate marketing site basically gives you a commission based on how many people who visit your blog and click on their ads. You don't have to create the ads yourself. Please don't click on the ads on your website or ask anyone to click at any time, because you will get banned from the affiliate marketing programs. Use social media, Facebook, Google+, Twitter and Instagram to post a link to your blog on pictures and comments. The most important thing is to only post your blog links on relevant articles, pictures and comments sections. For example if your blog is about resume writing then only post your blog links on resume related articles, pictures and comment section on social media. Follow these simple steps an the right people will click on your blog links and visit your blog and then click on your affiliate marketing links.